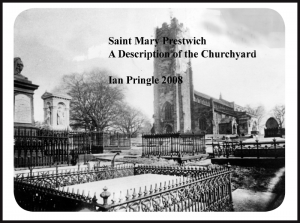 Ian Pringle’s guide to the graves and monuments in Prestwich Parish Churchyard ( St. Mary’s) is now available. It includes a numbered plan of the churchyard showing where graves and monuments are located. Ian has been instrumental in getting many monuments in the churchyard Listed by English Heritage. A very informative book, useful for genealogical research in Prestwich families. The churchyard of St Mary Prestwich illustrates the chronology of a community. 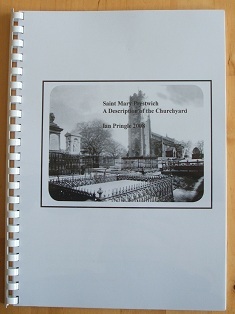 This booklet connects the history of Prestwich with its dead. The desperate struggle of its population when a short life was expected is enlivened by the celebration of the unexpectedly long-lived. The pathos of death, often of young children, is contrasted with the unexpected joviality of some gravestone decoration. Here lie servants and free men, Lords and Ladies, lunatics and merchants, Members of Parliament alongside the soldiers they sent to war. The tragedy and heroism of war is recorded in the inscriptions. Soldiers are represented in all the generations found here. Much grand architecture is concealed – but those who look may find it. Also found is the unexpected, the poet, the naturalist, the artist, the engineer and the first electrician. All are buried here, many with a verse to speed them on. Sometimes the verse challenges their death, sometimes reflecting their lives of pain, or their bravery in the face of it, and hopes for a better life to come. The social history of Prestwich is to be found in careful reading. Indeed a privilege to be the first comment from far off South Africa to which land my grandfather Ernest C Smethurst sailed in 1900. A good number of our mutual forebears were discovered in this Churchyard although not yet identified by graves during our visit in July 2013. Compliments to Ian Pringle for a his efforts in helping to, hopefully, put the final pieces of a jigsaw puzzle together. Just wondered if you knew where the area called “Fleams” May have been. Any help would be appreciated. Mel- one of my relatives William Booth married Martha Smethurst in 1771- can you help? Sorry for the delay, haven’t been back to this site.My research shows a 4th Great Aunt Martha Smethurst born 1787 who could be named after a member of prior generation. Let me know if require further info. Hi is this Ian Pringle who grew up on Cawley Avenue?